Main gate design should be unique and stunning because it’s the first impression of your house. Usually, people recognize the interior design and luxury of the people living in, is through the main or entrance gate design of the house. That is the reason we strongly recommend, the gate should be designed perfectly by professionals. If you are living in a small town or you own a small house then you mostly have one front gate which you need emphasize on, But if you are having a big Villa or Bungalow then you have plenty of choices to have multiple gates and each can be designed differently like for guest you can have a different luxurious entrance gate design and for general purpose you can have another modern gate design. The very important factor in any gate design is its security. The Entrance gate of either house or office should be safe and secure. It should be designed in a such a way that it can’t be easily accessible and can protect your privacy. Whilst designing the entrance gate for a residence, you must gain the balance no longer compromising the safety and attraction of the front gate. Now a day the main entrance gate designs aren’t only for attraction, however, they are kept strong and safe from all like of thefts. More curious people add additional antitheft alarms within their gates. in case anyone tries to break it the alarm start to ring sup. Are you really choosy about your main gate design and its look? Do you think that your home interior design is more important than exterior designs? Are you happy with the standard and dull look of your home and exterior design? I am sure your answer is a big NO. So if you really want to impress the people with your modern house design. You have to consider each and every area and the main entrance gate design is the first thing to impress. 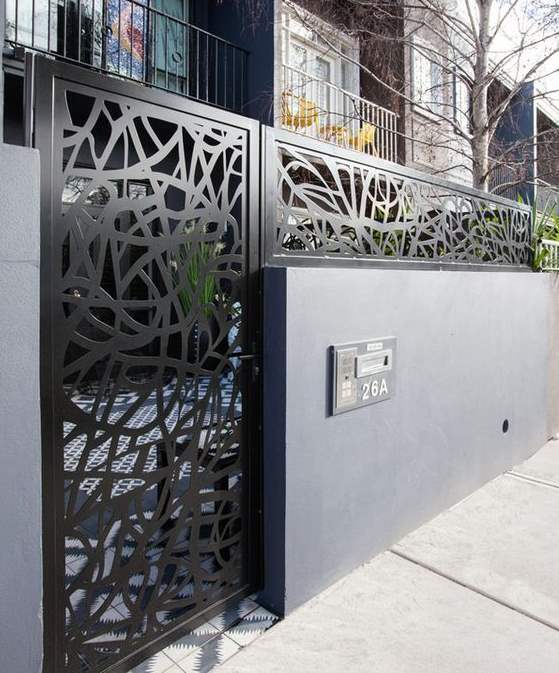 Take a look at these stunning gate designs and choose the best one for your next project. As discussed and agreed that main gate design is the first impression for any visitor. Until you have your friends entering your home through your windows or roof directly. Just Joking, As this is the only entrance so you want to make it perfect. If you haven’t think about it. This is the right time, hire any professional to have a modern gate for your home. Moreover, people also take extra measure to design their driveways, garden and lawn design and facades looks. If you are still living in an old and traditional house. Why not start with the new entrance gate and change the trend and let people notice that you are now, also a part of modern community and architecture. These are gates which usually see in the homes and backyards. In these type of gates, the very popular one is sliding gate and it suits small garages because it took small space and allow the person to have a big room for parking. Swinging gates are usually the normal gates which you can see on the ordinary door. They have one or two parts wings that can be pulled and pushed to open and close. Small homeowners prefer this type of gates because they are bit cheaper and can easily be available and repairable. The elegantly designed gate fall under this category because the design is more customizable as compare to the sliding gates which we explain above. These kind of gate are extremely small and only used as a passage for day to day life. Usually, we don’t keep such kind of door for our guest. Only for house members and servant. 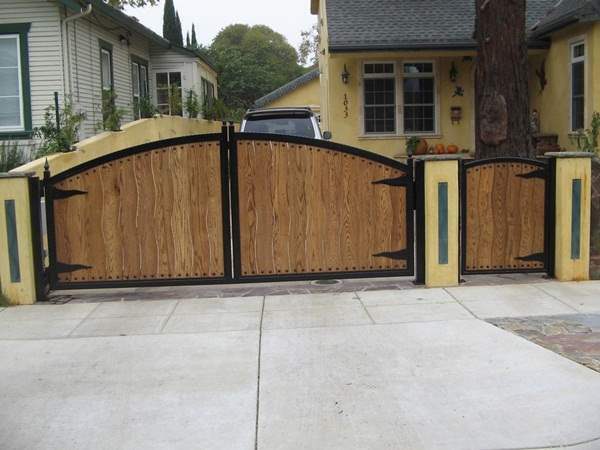 These gate designs are usually similar with the driveway gate. In this article, we usually target the big or multi door main gates. I really hope this article will help you out to find the right and modern entrance gate for your house. Do let us know in the comments section below and we will be happy to assist you further. We can’t display all of them on a single page so for your convenience we have converted this into pages. Do visit all the pages and lets us know which one is your favorite.